Absolute Software Corporation has released Absolute Manage 6.7, offering full support for Mac OS X Yosemite within the Apple Device Enrollment Program (ADEP). This lets Absolute customers remotely provision employer- and employee-owned Macs as part of the standard device set-up process, ensuring that all new Macs are registered and compliant from the first use. (www.air.org)The American Institutes for Research (AIR) is teaming up with Microsoft and AssistX Education, LLC, to offer students a secure, online assessment environment for Windows 8 devices. 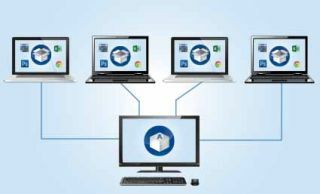 AIR Secure Browser 7.2, bundled with AssistX’s TestPolicy for AIR, creates a standardized testing environment for Windows 8 that provides schools with a simple way to achieve testing compliance in preparation for assessments. Autodesk, Inc. has made its design, engineering, and entertainment software free to students, instructors, and academic institutions. Now, schools can access the full suite of next generation cloud-based design products, cloud services such as the A360 collaboration platform, and maintenance subscriptions at no cost. Citelighter has enhanced its teacher and administrator functionality across elementary, middle and high school levels, offering platform users the ability to assign, monitor, and improve students’ writing. Students can use outlines, prompts, and content capturing tools to find and organize their own ideas or research from the Internet. Then, they can arrange information in a way that allows them to see the connection of their ideas as they write. Classroom Orchestrator by Lightspeed Systems offers teachers a view of all student screens to verify which students need help and which students are ready to move ahead. Classroom Orchestrator integrates with school Student Information Systems, simplifying the process of adding classes and students. Follett has introduced Destiny Resource Manager, a universal system that enables K-12 districts to track and manage all school assets. The system monitors barcoded textbooks in addition to traditional assets such as laptops, tablets, and equipment. Teachers get a complete view of each student’s responsibilities, including print and digital textbooks, tablets, and band instruments, as well as special education, STEM, and sports equipment. Discovery Education has added hundreds of new titles to its flagship Discovery Education Streaming and Discovery Education Streaming Plus services, with a heavy focus on core academic areas for grades K-5. The Discovery Education Streaming Plus service offers a digital library of instructional videos, skill builders, writing prompts, multimedia activities, and articles that are aligned to state and national curriculum standards. Edgenuity has released a new curriculum designed to help middle and high school students learn and engage in a safe manner online. The course includes lessons on interacting with digital curriculum, understanding digital leadership and safety, practicing proper “netiquette,” dealing with online harassment and cyberbullying, and other key topics. Edmentum will release over 70 Career Technical Education (CTE) courses for the 2015-16 school year to help students explore career options and receive training. The courses cover Arts, A/V Technology and Communications, Business Management and Administration, Health Science, and Information Technology. The CTE courses are designed for use with mobile devices, and feature real-world content and multimedia to keep students engaged. Excent Corp. has released Enrich State, a special education data management system designed to help school districts adjust to new Results- Driven Accountability (RDA) monitoring requirements. The Web-based solution provides real-time, statewide data collection for improved local and state compliance and special education program management. Enrich State can receive data from any Individualized Education Plan (IEP) software or student information system. Designed by teachers, for teachers, Exibi consists of a private workspace and a moderated showcase. It offers tools to help students independently manage and reflect on their collections of work, and then exhibit their collections in an environment made safe through teacher or administrator controls. Funds For Learning has released its E-Rate Filing Window Survival Kits for Funding Year 2015. The kits help school districts prepare for the opening of next year’s window by helping them navigate through the E-rate program. The program is designed to help administrators secure funding for their schools and libraries, and offers tools to help them manage the process. Gale, part of Cengage Learning, will make content from its Gale Digital Collections available to academic researchers for data mining and textual analysis. This initiative will help researchers draw new conclusions among disparate data. “Term cluster” and “term frequency” tools will sort through the text and index terms from the content, generating visual displays of information to help researchers identify relationships between words and phrases. Metria recently launched Metria Master Teacher Edition, a curriculum management, formative assessment, intervention management, and student growth monitoring system. The cloud-based application is free for the 2014-15 school year, and $29.99 for an annual subscription. MindPlay recently launched a new professional development course to help teachers share best practices and learn about effective reading instruction strategies. The course uses a combination of lectures, videos, written information, and activities, organized into eight modules to inform educators on what every student needs to become a proficient reader. Teachers can earn up to eight hours of professional development credit for successfully completing the course. WGBH has launched an all-new bilingual Web site and curriculum for Peep and the Big Wide World, the Emmy Award-winning preschool science and math series for 3-5 year olds. The new Web site, available in both English and Spanish and narrated by John Cusack, includes PEEP animated episodes, live-action videos, new games, and family activities, as well as an extensive collection of educational materials and professional development tools for center-based and family-based preschool educators. Learning.com has released Project NextTech, a high school digital literacy course that helps prepare students for success in high school, college, and beyond. Project NextTech addresses the 24 performance indicators in the ISTE Standards for Students and lets students demonstrate their skills through projects and a final portfolio. QuickSchools launched a Standards-Based Gradebook (SBG) app for teachers and administrators to gauge student mastery of CCSS and provide vital data for institutions as to the effectiveness of CCSS long-term. The fully cloud-based application is currently available free to customers who are on the Apollo and Athena plans. (www.quickschools.com/quickschools/pricing) The app plugs seamlessly into the school information system (SIS) offered by QuickSchools and eliminates the need for redundant paper records or re-keying student data. Sunburst Digital now offers Rand McNally World Atlas, a new online educational resource that delivers dynamic maps with social studies, history, and geography content, as well as suggestions for lesson plans and writing connections. The platform lets users create, draw on, annotate, and share custom maps. (www.readytesta-z.com)Learning A-Z, has launched a new Web site, ReadyTest A-Z, featuring downloadable resources that are designed to help grade 3, 4, and 5 teachers provide effective high-stakes ELA assessment practice and instruction. The kid-friendly site helps students develop high-stakes testing skills, while teachers can monitor student progress and provide customized instruction. Curriculum Associates has introduced Ready Writing for grades 2–5. The research-based program provides educators with rigorous instructional materials as well as professional development resources to help students meet the writing expectations of the new CCSS standards. The program also works seamlessly with any ELA curriculum, including Ready Reading. SchoolCircle is a free, easy-to-use Web application that simplifies pre-K-grade 6 teachers’ lives by eliminating the paperwork related to communicating with parents. Once a teacher spends a few minutes creating their “class circle,” the communication with parents is automated. GuideK12 recently launched SchoolSearch, a comprehensive online communication tool that’s designed to help districts communicate boundaries, program or school options, and more. Parents can filter by school type or program offerings to identify school locations on a map in relation to where they live. School districts can customize their information to include registration links or other important content in the portal. SMART ROOM SYSTEMS FOR MICROSOFT LYNC. SMART Technologies now offers Services for its SMART Room Systems for Microsoft Lync. The new services offering includes network readiness check, usage reporting, and proactive monitoring, for the SMART Room System (SRS). The Network Readiness Check ensures a customer’s Lync IT environment is optimized for SRS deployment. Usage Reporting generates visibility into when and how SRS are used, quantifying ROI and driving adoption and deployment decisions. Proactive Monitoring of SRS 24 x 7 provides visibility into the health and operability of systems and allows for early incident detection, minimizing downtime. Tobii Dynavox has released an English- Spanish version of its Compass Software, which helps students with communication challenges communicate more effectively. Spanish Compass is included with all Tobii Dynavox devices, on the iPad app and in a free update for existing Compass software users. TeacherCoach, LLC, has announced a new online resource community for educators that integrates Personal Growth with Professional Development (PGPD). TeacherCoach’s online training combines coaching with online multimedia courses, to help teachers develop in their careers as well as progress in their emotional well-being. TenMarks Education has launched TenMarks Math Teach, a professional development, preparatory, and in-class resource for teachers. The program focuses on grades 2-6, with instructional resources for 12 core standards available at no cost to educators. Thinlabs, Inc. has released Thinlabs Device Manager (TDM) 4.0, the next generation enterprise-class remote device management solution that improves upon its predecessor, Aurora. New features include remote script deployment and execution, support for both Windows and Linux, silent software distribution, and an intuitive interface that lets users manage both PCs and thin clients. Mentoring Minds has launched Total Motivation, a standards-aligned, supplemental curriculum, delivered in a combined print and online solution. The program offers real-time, visual feedback of student performance on all Common Core content standards, allowing educators to easily target their instruction for each learner. Tripod offers free access to a new platform where teachers of grades 3-12 can administer annual, classroom-level student surveys and receive confidential online reports to support their practice. Tripod’s scoring engine uses data from over 125,000 classrooms to calibrate survey results. The reporting highlights areas of strength and provides guidance about opportunities to improve. A new review of Common Core Support Coach, a targeted instruction curriculum for students who require intervention or additional foundational support with Common Core standards, shows the curriculum provides effective research-based tools in math and English language arts (ELA) for students in grade 3–8. Developed by Triumph Learning Support Coach helps teachers identify gaps in student understanding and supports their areas of need in key foundational skills. ContentKeeper has released TurboBridge, an Ethernet bridge technology designed to meet the high-speed performance and scalability demands of districts’ bandwidth requirements. TurboBridge retains high performance and bandwidth capacities even when SSL decryption features are active, allowing for full inspection and filtering of all (or selected) secure Web traffic. Triumph Learning has announced Waggle for the Smarter Balance Assessment Consortium (SBAC). The assessments in Waggle include 26 different item types that students will see on the SBAC assessments, including Part A and Part B problems and performance tasks. (www.adobe.com)Adobe has released a family of mobile apps and enhanced Creative Cloud desktop tools, designed to enable students and teachers to access creativity tools both in and out of the classroom. The Adobe Shape CC and Adobe Brush CC let users capture real-world shapes and textures and then use them as vector objects and brushes, while the new Premiere Clip brings advanced editing tools to iPhone and iPad video. Aruba Mobile Engagement is an enterprise-grade solution that integrates best-in-class enterprise Wi-Fi and location services with a mobile app platform. The solution integrates Aruba Beacons with the Meridian mobile app platform, enabling users to provide a variety of location-based features through a mobile app. For instance, the app can provide turn-by-turn directions to guide visitors to different locations in an indoor setting. (www.truenorthlogic.com)Truenorthlogic has purchased Avatar TMS (Training Management System) from Generation Ready. The Avatar system assists human resources departments in K-12 schools by automating course registration, management, and certification tracking for educators. Blackboard Inc. has released a tablet app designed to improve teacher workflow around assignments and track student submissions. Teachers and faculty can easily track, sort, and grade student assignments across multiple courses directly from their iPads. Furthermore, they can offer text, audio, and video feedback on submissions as well as view metrics on potential student performance risks. The Boardmaker Student Center app, available with a subscription to Boardmaker Online, is a free tool that allows students to play Boardmaker activities on an iPad. Boardmaker’s symbol-adapted special education software helps students overcome their speech, language, and learning challenges. Houghton Mifflin Harcourt has launched Curious World, a Web site and app designed to help young kids prepare for school and the world. The program features activities that spark curiosity while helping kids meet key developmental milestones for kindergarten. The app also lets parents keep track of their child’s progress. DIY SUN SCIENCEDIY Sun Science is a free NASA-funded reference tool that's packed with information and activities related to the sun. Kids can tap to explore three different areas within the app: Activities, Images and Videos, or the Sun Observatory. The 13 hands-on activities are each organized into sections that make it easy to plan and conduct the activity. Lauren Innovations has introduced a flipchart application that gives users easy access to emergency and crisis preparedness flipcharts from their mobile devices, without the need for an Internet connection. Administrators can customize their flipchart content into the application, assign labels, create call lists, and more. (www.panthertechnology.com/products/math-paper)Panther Technology has teamed up with App Partner to launch Math Paper, an educational app for the iPad. Math Paper is designed to address the difficulties that students with motor or learning challenges may face in a classroom environment. The app enables students at all academic levels to do math more easily. SMART Technologies has released the SMART Notebook Maestro software, enabling teachers to remotely control and interact with SMART Notebook collaborative learning software on any interactive display through the SMART Notebook iPad app. Teachers can change Notebook pages and add and manipulate objects while moving around the classroom. Spellex has released a native medical spell checker for Android devices. Users can simultaneously spell check both medical terms and common English text while typing in browsers, email, messages, and notes without having to copy text to a third party spelling app. The app can be used with or without an Internet connection. TestPrecision has launched its ACT/SAT app, offering a two-step diagnostic and adaptive approach combined in one test prep platform. TestPrecision employs its Rapid Diagnostic Comparative Testing (RADIACT) technology and an exclusive Psychometric Test to determine which of the ACT or SAT best matches a student’s strengths. Then, TestPrecision personalizes and customizes practice questions based on student performance. The TIME for Kids Classroom App brings exclusive current events content to life through interactive images, videos, animations, polls, maps, and more. The app lets teachers integrate multimedia and real-world connections into their K-6 classrooms, address students’ individual abilities with leveled content, meet Common Core State Standards, and put current events into context for young learners. The app offers audio text and vocabulary definitions to support learners, as well as a version of select articles for the grade level below. Netop has released the Vision ME iPad classroom workflow app, designed to make teaching in iPad classrooms easier and more effective. The app combines teaching tools with mobile device management (MDM) capabilities to provide a classroom workflow app that engages students and improves learning outcomes in iPad classrooms. Teachers can present lessons directly on classroom iPads, showcase student work, blank student screens, block Internet access with a single click, administer Web-based tests and quizzes, and more. BenQ America Corp. (www.benq.us) has released the Colorific PX 9710, PW9620, and PU9730 DLP displays. Featuring up to 7,700 ANSI lumens and flexible installation options, the displays let teachers cast high quality content easily within any ambient lighting environment or large venue. The PX9710, PW9620, and PU9730 offer XGA (1024x768), WXGA (1280x800), and WUXGA (1920x1200) resolutions, respectively. Epson America, Inc. (www.epson.com) has announced the Epson WorkForce WF-100, the smallest and lightest mobile printer available on the market. The WorkForce WF-100 includes built-in wireless connectivity and an integrated rechargeable battery, for printing from nearly anywhere and nearly any mobile device. The WF-100 also features an automatic power-off feature to save battery life. Vernier Software & Technology (www.vernier.com) has expanded its line of wireless sensors with the Go Wireless pH and the NODE+ CO2 Gas and Thermocouple sensor modules. The Go Wireless pH is a rugged, general purpose sensor designed to remotely conduct pH measurements using devices such as the LabQuest 2 or iPad. The NODE+ sensor modules are compatible with the NODE Wireless Platform and Vernier’s Graphical Analysis for iPad and iPhone, as well as a collection of iOS and Android apps from Variable, Inc.
Mimio (www.mimio.com) has expanded its MimioClassroom suite of products to a full range of interactive teaching technology options. The latest addition, the MimioBoard touch board, features six-point Touch 360° interactivity, which accommodates up to six single-point touch users or three dual-touch and gesture users. Available in 78-inch and 87-inch models, the MimioBoard touch board provides a 16:10 aspect ratio for widescreen views. The Porcelain-on-Steel surface is classroom-rugged, projection-optimized, and erasable, so teachers can also use it as a conventional whiteboard. InFocus Corporation (www.InFocus.com) has released the IN118HDa, short-throw IN118HDSTa, and networkable IN2128HDa projectors. The IN118HDa is rated for 3000 lumens while the IN118HDSTa is 2700 lumens. Both have HDMI, VGA, S-video, and composite connectivity options, 15000:1 contrast ratios, and up to 10,000-hour lamps. The IN2128HDa has the same contrast ratio and connectivity options as the other new HD projectors but adds network connectivity through a LAN port, a USB port for presenting directly from a thumb drive, optional wireless connectivity, and Miracast support for wireless display from mobile devices. Kensington (www.kensington.com) has released the PresentAir Pro Bluetooth 4.0 LE Presenter, which features three different function modes to support different types of activity — presenting, controlling media, or editing — in a slim design. The free companion app, PresenterWorks, allows users to set buttons to the functions of their choice. The app is available for Android, Windows, and Apple devices. NEC Display Solutions of America (www.necdisplay.com) has released the MultiSync PA322UHD monitor, featuring a wide gamut white LED backlight and an IGZO technology IPS-type LCD panel that delivers excellent image quality with lower power consumption than similar LCD displays. The monitor offers two DisplayPort, two DVI-D, and four HDMI inputs, as well as a USB 3.0 hub. Acer America (www.acer.com) has announced the TravelMate B115 notebook PC, featuring an 11.6-inch HD (1366 x 768) display with 10-point multitouch support. The notebook is less than one-inch thin and offers up to 10 hours of battery life for a full day in the classroom without having to recharge. The display eliminates glare, so it’s perfect for use outdoors. Swivl (www.swivl.com), a robotic mobile accessory solution with secure cloud content hosting, has exited beta mode and announced a new set of features, as well as integration with Android devices. The Swivl robot tilts and rotates to follow the presenter as he or she moves around the classroom, recording wireless video and audio with its Cloud and Capture app. Swivl then automatically uploads these recordings to its highly secure network. New features include unlimited uploading with content staging, 2x faster uploading speeds, and cloud exporting of produced files to a computer or to YouTube. NewTek (www.newtek.com) has released the TriCaster Mini, an ultraportable system that lets users easily transform an ordinary presentation into engaging multimedia content that looks like network-style TV. Users can assemble visually sophisticated multimedia presentations and stream them live, publish to social media, or upload to a Web site from any location with an Internet connection. Epson (www.epson.com) has introduced the PowerLite 520, 525W, 530, and 535W short-throw projectors and the BrightLink 536Wi interactive short-throw projector. These models deliver large, colorful images projected from a short distance with minimal shadows or glare. Teachers can wirelessly connect up to 50 devices and share students’ work from up to four device screens simultaneously.